My oldest and dearest friend in the whole wide world lost her husband last Thursday. George put up a valiant fight. He was diagnosed with cancer 22 months ago. I saw him last October. I knew it was going to be the last time. He had a peaceful passing in his own home and I am sure he is now in Heaven telling bad jokes! Monday morning I set off for the airport to fly up to White Plains. Soon after I got to the gate, the flight was cancelled due to bad weather. I was booked on another flight four hours later with a stop and transfer of planes in Washington. So instead of landing in NY at 2:30, I was leaving ATL at 2:20. Trip up to Washington was bumpy but okay-plane was late. 20 minutes to make it from one end of Reagan National to the other end, check in and get on the plane. It is a good thing that that plane was also delayed. Plane now due to leave at 6:15. I had never been to Reagan (and hope never to go again). Announcement made to board plane: go downstairs and get on a BUS that drives you out to the plane. We all get on..and then the pilot announces that the mechanic think one of the tires is low. Next announcement-they will be changing the tires on the plane. Do not get out of your seat as the plane will be jacked up. Okay.....90 minutes later we are able to get underway. Poor Kathy. She has been checking all day on my location. The car service at this point will not be taking me to the funeral home because I have missed the whole wake. Plane finally lands and I head for Mahopac. 13 hours after I left home, I got to Kathy's house. But I did make it safely and I got to be with Kathy. I finally got to yesterday's block of the week. It went together without too much difficulty. On the other hand, there is last week's block which is a disaster! I guess I will need to do it over again. I was okay with mine until I saw Sarah's and Kristie's. Then again, they are really good with applique. So I will go back to the drawing board. Maybe I will take it to quilt retreat! Willie likes to guard the backyard from his perch in the sewing room. He has quilts to rest on while he watches for birds and other critters. 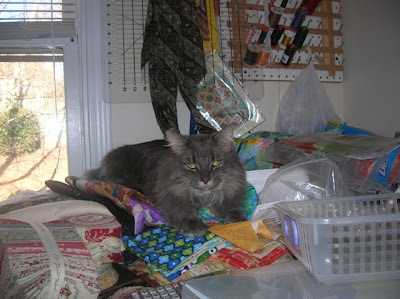 Today I guess it was a little chilly, so he moved over a bit to one of the piles next to my sewing machine. I really need to do some decluttering. See that yummy Moda bundle of French General? It is just waiting for the right project. No progress on Comfort and Joy this week. 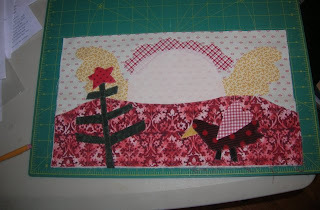 I need a little rest from applique! I have gotten dressed for the last six days in a row! But I knew I had issues when i did the laundry and discovered that it was mostly pajamas. Gone are the uniforms and work clothes of yesteryear!!!! But on a rainy day, like today, I feel comfy clothes are in order. It has been gray and rainy all week. But we need the rain, so I shall not complain. Today I am playing. 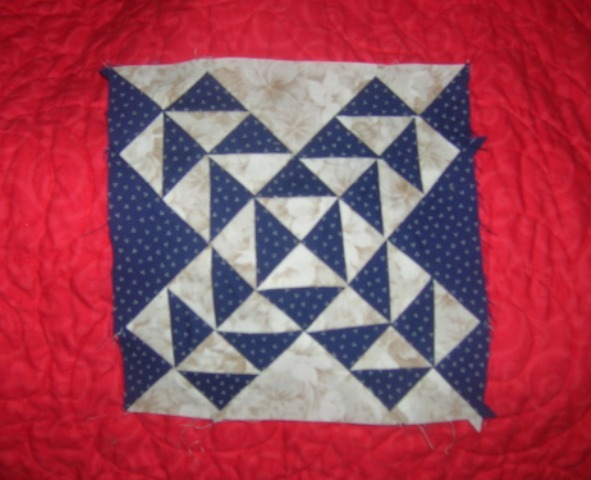 I picked up the magazine Quilt Almanac a couple of weeks ago. It has lots of good stuff. 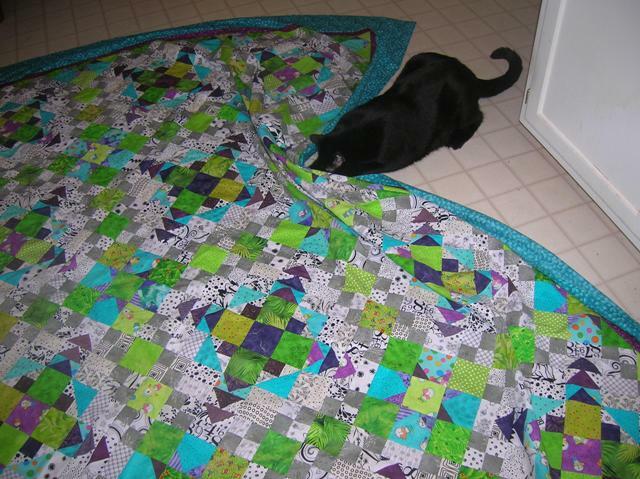 AND my gal, the Queen Patricia of Silver Thimbledom has a quilt in the mag too. I made it's sister quilt-Emily Jane last year. I used French General fabbie. I love the creams, reds and taupe of French General. 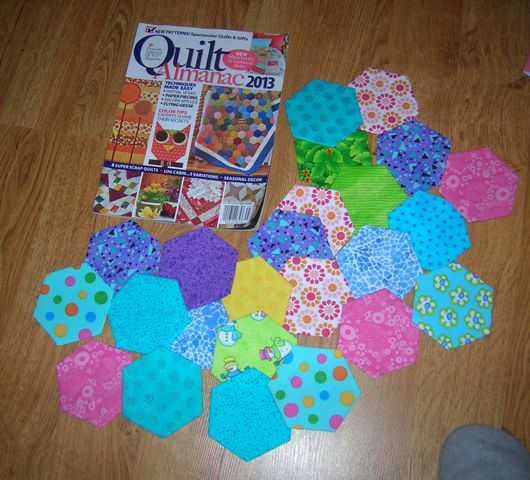 I am playing with big hexies. I bought the templates last summer and they sat and sat. Now I am in production. There are 277 in the quilt in the magazine. I have 24 done. Tomorrow is Thimbles!!! YEAH!!!! I think I will work on a Just for You quilt. I have one that needs to be layered up and quilted and I cut up some monkey fabric today. I am going to make a disappearing four patch. The block of the week. Getting close to the half way mark on this baby. This is one of the easier blocks. Gotta like that! And I continue to plug along with Comfort and Joy. 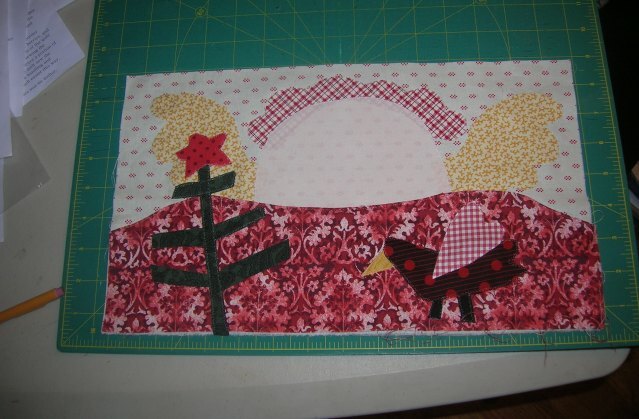 I think I only have 5 more applique sections to do and then all those dang birds and berries on the border. BUT I am determined!! Also on tap this week is the construction of the backing for Easy Street. I already have the binding made. Easy Street is DONE!!!! I am so very happy with the way it turned out. 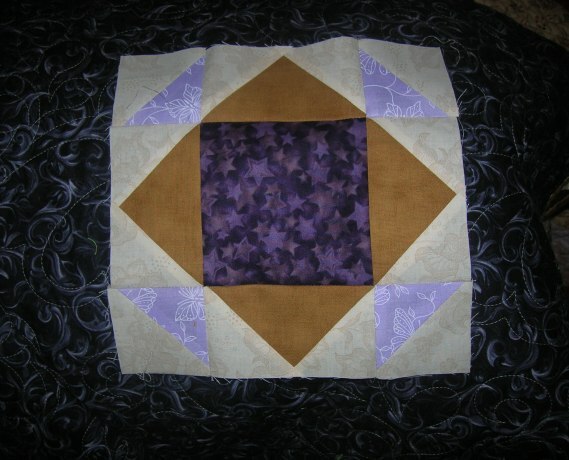 I did make a change in the outer border. I had started to put another one on but it just would not work-off it came! This one is much better. Spooky is being diligent with his inspection duties. I guess it passed as he is now napping! I can not believe how many people have already finished this mystery. There were many pictures on the yahoo site. I am working on other stuff as well. In fact, I must get back to the Santa face on Comfort and Joy. One would think multiple personalities lived in the sewing room! Progress continues on Easy Street. I am constructing rows. And then there is Comfort and Joy. The snowman and the angel still need facial features. 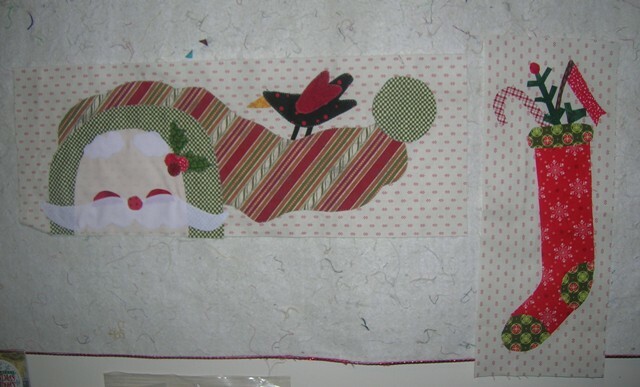 This week I will be working on Santa face. I had to do Blogger Girls Block of the Month. It is only for 6 months. 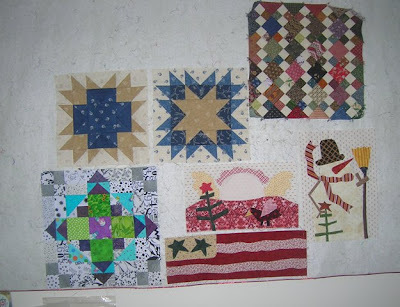 The 2 blocks are done for January. Barbara Brackman has another Civil War Quilt starting. I have the first block sketched out. I am planning on foraging in the sewing room for that one. The other item on the wall is a kit that I won at Summer Stitch-In. zit has been done for awhile. Now it is living on the wall until inspiration hits! My computer is being finicky again. I hate that. I sure hope this publishes with the picture. 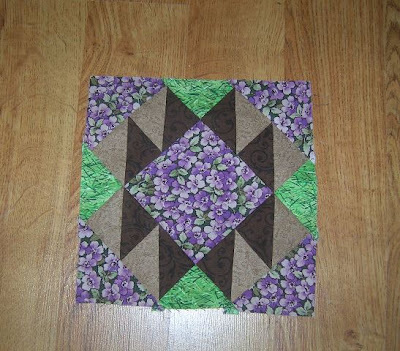 Block is called Old Maid's Ramble: Desperate Walkers. It took me all morning to do this little block. The directions on the site were less than clear. I finally did it my way. There was some unsewing done a couple of times. Oh well, it is done. Now let's see if this goes through and if if does, I can remember it the next time! I am still plugging along on Easy Street. I have 17 more blocks to go. And (drum roll, please), while in the sewing room I found fabric for inner and outer border and almost enough for a backing-all from my stash!!!! The pool reopened yesterday and I was glad to get back into the routine. I must admit to some muscle stiffness last evening. So I have been working on this one block all morning. There has been a bit of unsewing going on. I am not a real "green person" and I was a little unsure yesterday when I was doing the side triangles but the white/black background seems to tone it down. 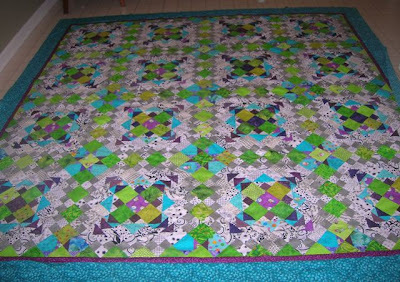 The quilt consists of 2 different blocks. 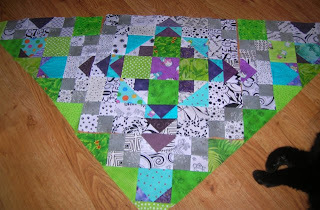 I have one of the other blocks partially finished and there is more green in it. It is fun to see my little snowmen peeking out every now and then. Spooky wanted to check out the progress before he headed off for his nap.